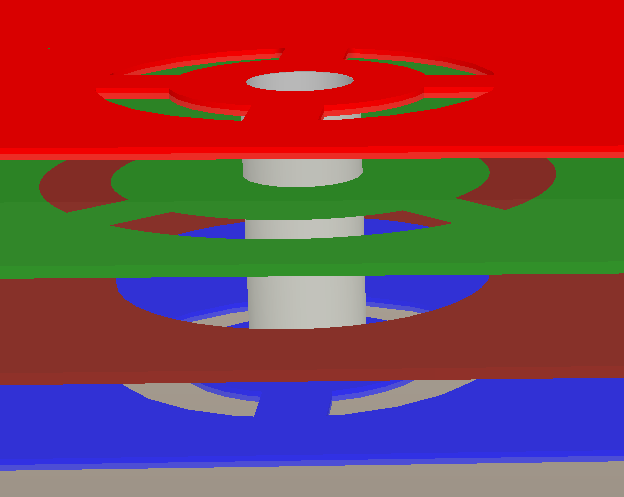 A via that spans and connects from the top layer (red) to the bottom layer (blue), and also connects to one internal power plane (green). A via is a primitive design object. It is used to form a vertical electrical connection between two or more electrical layers of a PCB. Vias are a 3 dimensional object, having a barrel-shaped body in the Z-plane (vertical), with a flat ring on each (horizontal) copper layer. The barrel-shaped body of the via is formed when the board is drilled and through-plated during fabrication. In the X and Y planes, vias are circular, like round pads. The key difference between a via and a pad is that as well as being able to span all layers of the board (top to bottom), a via can also span from a surface layer to an internal layer, or between two internal layers. Click Home | Place | and select Via. Position the cursor and click or press Enter to place a via. Continue placing further vias, or right-click or press Esc to exit placement mode. A via will adopt a net name if it is placed over an object that is already connected to a net. Typically vias are not placed manually, they are placed automatically as part of the interactive routing process. When a net is being interactively routed, you can cycle through the available signal layers by pressing the * key on the numeric keypad. Alternatively, use the Ctrl+Roll Mouse Wheel combination to move through the signal layers. When this is done the software will automatically place a via, in accordance with the applicable Routing Via Style design rule. Note that multiple Via Style design rules can be defined, allowing different via sizes to be assigned to different nets. When a via is placed in free space, it is not possible for the software to apply a routing style design rule during placement. In this situation the default via will be placed. Vias cannot have their properties modified graphically, other than their location. To move a via without moving the connected tracks, click, hold and move the via. To move a via and also move the connected tracks, click once to select it, then click, hold and move the via. The connected routing will remain attached to the via as it is moved. If a via is being moved with the routing to create more routing or component space, it can be more efficient to re-route than move routing. The software includes a feature called Loop Removal, with this feature enabled you simple route along a new path (starting and ending somewhere along the original routing), as soon as you right-click to exit the interactive routing mode the old routing (loop) is removed, including any redundant vias. This method of editing uses the Via dialog to modify the properties of a via object. Edit the properties of the Via in the dialog. Via's are a key element of the routing, this section provides valuable information on working with them. The default is for a via to span from the Top Layer through to the Bottom Layer - this is known as a thru-hole via. In a multilayer board a via can also span other layers. The possible layers that a via can span depends on the fabrication technology used to fabricate the board. The traditional approach to manufacture a multi-layer board was to make it as a set of thin double-sided boards, which are then sandwiched together under heat and pressure to form a multi-layer board. The number and type of layers available will depend on the current software license. The image below shows a 6 layer board, as shown by the layer names down the left of the image. This board would first be fabricated as 3 double-sided boards (Top-Plane1, Mid1-Mid2, Plane2-Bottom), as indicated by the hatched core layers. These double-sided boards can have via sites drilled if required, forming what are known as blind vias (via number 1) when the via spans from a surface layer to an inner layer; and buried vias, when a via spans from one internal layer to another internal layer (via number 2). After the layers are pressed together into a single multi-layer board, thru-hole vias are drilled (via number 3). The 3 types of vias that can be created, blind (1), buried (2) and thru-hole. Another type of multi-layer board fabrication technology is call Build-up technology, where layers are added one after the other, often over a double-sided or traditional multi-layer board. When this technology is used vias can be drilled with a laser after each layer is added during the build up process, resulting in a large number of possible layer-pairs that can be spanned. The layer-pairs used for each via is defined by the Start Layer and End Layer settings for the via. If blind, buried or build-up type vias are to be used, the Drill pairs must be configured, with a drill pair for each layer-pair that a via spans. Consult your board fabricator if you are designing a multi-layer board that is going to include blind or buried vias, to ensure the optimal layer stack up and layer-pairing is achieved. When blind, buried or build-up type vias are to be used, the drill pairs must be configured. It is the presence of drill pairs that lets Altium Designer know that blind and/or buried vias are in use. This ensures that when the fabrication output files are generated from the completed board, there are suitable drill files for the various drill jobs that must be performed to create the blind or buried vias. Drill Pairs are configured in the Drill Pair Manager dialog, as shown in the image below. To open the dialog first open the Layer Stack Manager dialog (click Home | Board | ), then click the Drill Pairs button to open the Drill-Pair Manager dialog. The arrangement of the copper layers is defined in the Layer Stack Manager. From there the Drill Pair Manager can be opened to define the required drill pairs. An opening in the solder mask is automatically created by the software, the same shape as the via. This opening can be larger (a positive expansion value) or smaller (a negative expansion value) than the via itself, as defined by the Mask Expansion settings. The expansion is measured from the outer edge of the copper. Solder mask openings over a via can be slightly larger than the via copper area, they can be smaller to cover the copper area but not the drill hole, or they can be completely closed, which is called tented. The default is for the via to use the Expansion value from the Solder Mask Expansion rule, this can be overridden and local values defined directly in the Via dialog, if required. The term tenting means to close off. If a tenting option is enabled then the settings in the applicable Solder Mask Expansion design rule will be overridden, resulting in no opening in the solder mask on that solder mask layer for this via. When this option is enabled, the Expansion value from rules and the Specify expansion value options are ignored. Solder mask layers are shown in the negative, that is, when you see an object on one a mask layer it is actually a hole or opening in that layer. The solder mask can also be shown in the positive, more about this below. Use the Testpoint Settings to define this via as a testpoint for Fabrication and/or Assembly testpoint file generation. A testpoint is a location where a test probe can make contact with the PCB to check for correct function of the board. Any pad or via can be nominated as a testpoint. Separate Fabrication and Assembly Testpoint files are generated from the Outputs tab of the Ribbon. There are a number of display features available to help you work with vias. The copper ring of the via is shown in the current Multi-Layer color, the default is a light grey. 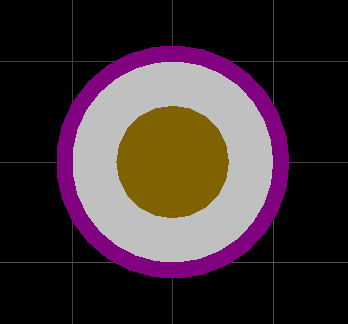 The via hole is shown in the current Via Holes color, the default is brown. Press the L shortcut to open the View Configuration dialog to change these colors, or to disable the display of holes. A thru-hole via on the left, the hole is shown in the default hole color. The via on the right is a blind via, the hole is shown in the start and end layer colors. The default presentation of layers in the PCB editor is to always show the Multi-Layer as the top most layer. That can make it difficult to accurately view the contents of the solder mask layers, especially when a pad or via uses a negative mask expansion, as the solder mask layer contents will disappear under the multi-layer object. Display the Solder Masks in the Positive and change their Opacity - the solder masks can be shown in the positive, and be made semi-transparent using the Solder Masks options in the View Options tab of the View Configurations dialog, press L to open the dialog, as shown below. Change the layer drawing order - set the Current Layer to be drawn as the top-most layer in the Layer Drawing Order dialog. The dialog is accessed via the PCB Editor — Display page of the Preferences dialog, select File » System Preferences to open this dialog. Click on the Top Solder tab at the bottom of the workspace to make it the current layer. By setting the Solder Mask to be positive and semi-transparent and changing the layer drawing order to show the Current Layer on top, then when you make the Top Solder the current layer the mask openings are accurately presented, as shown in the image below. The green arrows show the size of the solder mask opening for a via on the left, a pad where the mask opening is contracted in the center, and a pad where the opening is expanded on the right. 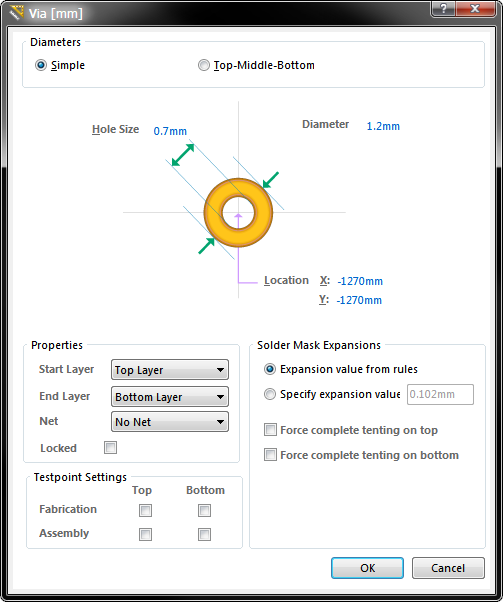 Configure the display settings to be able to examine the solder mask openings. To display the via net name, enable the Show Via Nets option in the View Options tab of the View Configuration dialog (press L to open the dialog).